Here comes a brand new edition of Cheap Date, where I will recommend a few nerdy things for you to enjoy this week and the best part is that it will all be for no more than $30. Head past the jump for my recommendations. This week is a light one. There was not much to choose from that I would say plop your money down right away. You could always check out Brad Pitt’s Oscar bait, Killing Them Softly, but it did not sell me as a must see. This week I only have two items that should be good to hold you over until next week. Another Marvel NOW! book starts this week in FF #1. The book has one of my favorite writers and artist teaming up for the first time. Matt Fraction continues his takeover of the Fantastic Four universe with the off-beat, cult-favorite art of Mike Allred. 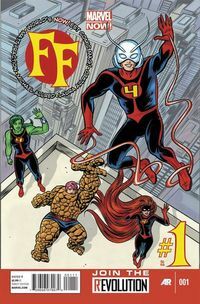 We have four new members of the FF filling in for the Fantastic Four and it is an electic bunch. ThinkGeek has come up with a redstone ore block replica from Minecraft. The best thing about is that it lights up as you tap it. There are three different settings for brightness. If you are a Minecraft fan, then this is a can’t miss item especially right before the holidays. Hopefully this will sate you for this week as next week we will see the release of The Dark Knight Rises on Bluray and DVD! Come back next week for another edition of Cheap Date.